- Comes in a clear tube with a thin liner brush. The bristle is very soft. The consistency is just about right, not too thick and not too light. 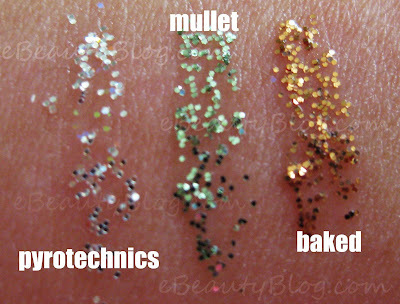 The glitters are tiny, as described by MAC they are "micro-fine glitter." It stayed on pretty well and comes off easily with water/cleanser. 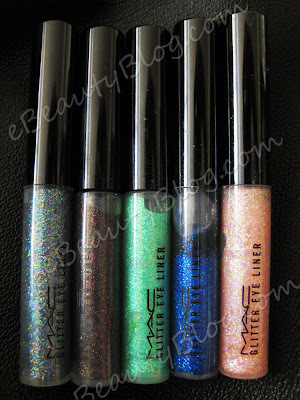 - It also comes in a clear tube with a thin brush so you can see how much there's left of the glitters. The clear liquid gel that holds the glitters together is quite thick. It comes off a little bit more messy than MAC. I have to use eye makeup removal to remove all traces. Overall, MAC is more suitable for every day look if you're looking for a little sparkle to your eyes but not too dramatic. 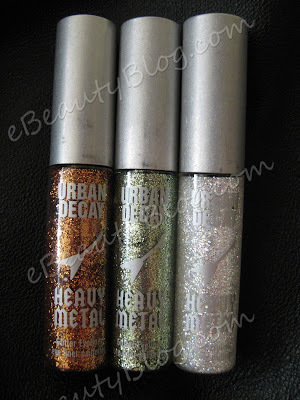 UD is more vibrant and intense in colors but a little too much if you're going to wear it for a day look. The only downside to MAC is they mostly come in limited edition, whereas, you could get UD anytime at Sephora. I like MAC better from your swatches! :) To think I almost got the UD ones. I'm so full... eek~ I've been cooking since this morning. i think i see an fotd coming from you in the future ;). gotta show how it's done. Hey there! Would you recommend buying those Fit Flops? sweeeeeet. 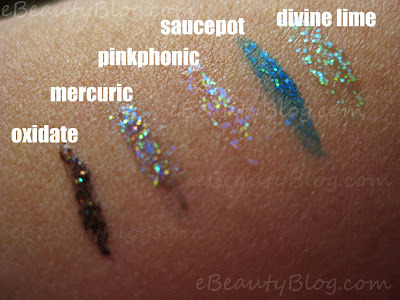 the mac's liners are cheaper and they look way better! thanks for a review. i will most definitely purchase some now! must..crush..lemmings! LOL! I nominated your for that award as well cuz I LOVE YOUR BLOG! Feel free to check it out at my blog! i thought they only sold brushes too, but they have train cases... you have to click on one of the links on the left hand side of the page to bring you to the page with the train cases. they're really cheap too! Hi lovely! HAHA yeah I feel like a giant sometimes because most Asian gals are in the 4'10-5'3 range! (I am 5'6"), maybe I should tell these gals to wear wedges when we hang out so I don't feel like a man, LOL! Of course I took pictures!... lol~ :P I promised you the soup and you got it... haha~ My dad loved it so much all he ate was the soup and rice. I'm not sure if I'm going to or not. Are you going to the Pow Wow? great collection! i'm too scared to use glitters, it's my age, i'm too old for it. hehe. nice review and comparison! thanks. JieJie, how come your blog is not accessible anymore? I’d yardstick the world of to ascertain that too!